Being quality conscious firm, we offer our clients varied the range of Refillable Spray Pump that is easy to install and are manufactured using quality assured raw components. We have gained a remarkable position in the market that is involved in offering Fine Mist Sprayer. 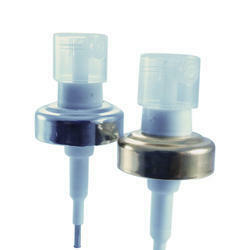 Micro sprayers & Lotion Treatment Pumps. In line with clients' diverse requirements across the nation, we are offering an excellent range of Rotate Nozzle Mist Sprayer. The offered sprayer is designed and manufactured at our ultra-modern manufacturing unit using the excellent quality material and progressive technology in conformance with defined quality standards.